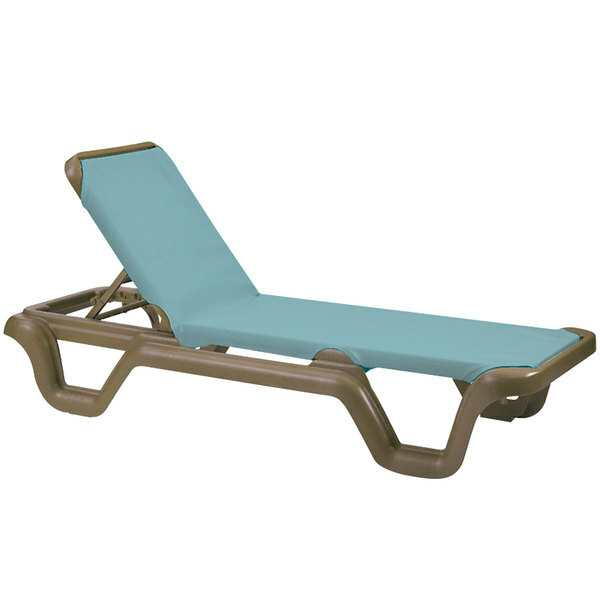 Give guests at your hotel, resort, or poolside bar a place to kick back and relax with this Grosfillex Marina adjustable sling chaise! This chaise lounge chair boasts a sleek bronze mist resin frame that easily adjusts for a quick poolside nap, relaxing with a drink, and anything in between. Its subtle spa blue sling provides guests with unbeatable relaxation thanks to a mesh vinyl-coated polyester fabric that's guaranteed to stay cool in the hottest summer sun. Featuring mildew, mold, and fungi-resistant properties, this chaise is as simple to maintain as it is comfortable. It's even UV-resistant to stand tough against fading and discoloration, effectively maintaining its attractive appearance throughout extended use! The Marina sling chaise includes recessed wheels for ease of mobility.